left cross is 54'' in height, 13.5'' tapering to 10.5'' in width, and 12.5 tapering to 10'' in depth. The central cross is 100'' in height, 16.5'' tapering to 10'' in width, and 14.5'' tapering to 10'' in depth. The cross on the right is 65'' high, 13'' wide, and 12'' thick at the base. Three Cross shafts. The cross on the left is dated to c.800. The cross in the centre is dated to the mid ninth century. 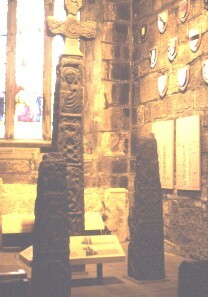 The cross on the right is dated to the ninth century. The cross on the left is the smallest and has two remaining panels on the front. The top panel has a beast entangled in strap-work with a trumpet-like snout. One of his hind legs is raised. The panel below has a figure holding a book. The figure has long hair ending in curls and no halo. This may represent Christ in Majesty (Hawkes). The central cross is the largest of the three. The figure on the top of the front face is Christ in Majesty. He appears to be sitting and holds a palm branch in his left hand. The three lower panels are of beasts.